Last Night My Daughter Had a Nightmare. This is Why I Can’t Get Over It. 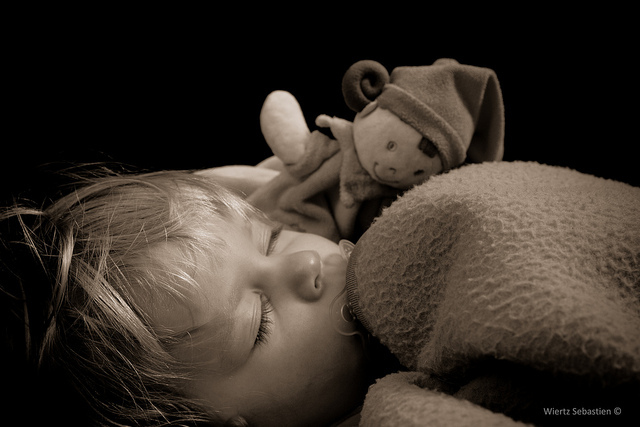 My peaceful, deep sleep was interrupted by the sound of a child crying. Hopping quickly out of bed, as my instinct has been since my 9 year old boy and 5 year old girl were infants, I bumbled down the hall trying to figure out who was crying. I opened my daughter’s bedroom door and rushed to lie down at her side, calmly saying her name and stroking her hair. Clearly she wasn’t awake but was instead in the throes of a nightmare. I began using the same soothing strategies I had used with my son, who has had what we think are night terrors since he was a toddler. As I lay next to Alyssa, she cried, “I’m just so cold!” Since it was a cold night, she was already covered with several blankets, on top of her fleece pajamas. I felt her head and knew she wasn’t cold. “What are you scared of, Alyssa?” She was still in her dream but I knew from experience my voice would bring reality to her quicker, hastening the end of the dream. “I’m scared I’m going to get hurt!” she wailed. The fear in her voice sent a shiver down my soul. I knew she was safe. I knew she was dreaming. I knew she would never remember this nightmare. But in that moment I started thinking about countless children whose nightmares are real. Iraqi girls and boys not much older than Alyssa being ripped from their families by ISIS. Syrian children fleeing with their families everything they know in an unreliable raft through treacherous waters where casualties are a daily occurrence. American children hiding in closets, hoping Daddy (or Mommy, or Mommy’s boyfriend), won’t find them and hurt them, again. Arkansas children sleeping at a DHS office because their home is no longer safe, and no foster homes are available. Yes, each of these scenarios pummeled my thoughts as I lay with my 5-year-old in safety and security. After her dream passed and calm sleep took over, I walked back to my bed and lay down, shaken by my thoughts. What can I do? I prayed, part desperate, part angry at the suffering, and part feeling guilty that my family has never known pain like that. Suddenly, my everyday comings and goings, my service in church, my next project on the blog that has commanded hours of my time this past week, seemed pointless. What does any of it matter when the least of these are living in a fear that even my daughter’s nightmare doesn’t touch? What about you? Have you been led in a particular area to serve the least of these? I’d love to hear it! Maybe God will use you to steer me and others in the right direction. This is a powerful post. hugs to you.